Meetings take up a significant portion of the work day and have evolved to solve a number of workplace challenges. We've created 12 customizable meeting agenda templates to help your team plan for and contribute to meetings more effectively to work together in more productive and effective ways. In 2018, hybrid teams hosted over 300,000 meetings. They can organize your team’s day to day projects, serve as a platform for brainstorming or thinking of new ideas, or be a tool for your human resources department to offer regular employee evaluations. For introverts and remote team members, pre-made agendas and clear schedules can help them to participate more fully and feel comfortable using their time to present. Save your team time and earn back resources by planning ahead and using these simple meeting agenda templates. These meeting agenda templates span a variety of meeting types and will help you start your meetings on time, use the time effectively, and get all team members on the same page. We recommend sending a call for agenda items in the days leading up to the meeting, then using our customizable meeting agenda templates to add all points, and finally sending out the agenda the day before or morning of the meeting to all attendees. There is a space on each template for what members should bring to the meeting which is an important step for keeping your meetings within the scheduled time frame. Send a calendar invite. Relying on verbal confirmation may leave you showing up on the wrong day/time, even for the most organized people. Include a location and a video link. Always be mindful to include a video link if you'll have remote attendees. It improves the meeting experience for everyone. Assign a meeting facilitator. When an entire group lets one person speak for 75% of the meeting, then assumes that the rest of the group can squeeze their material in in 15 minutes, people feel left out and ideas get ignored. The facilitator is responsible for running through the meeting agenda, ensuring remote participants are included, and tapping on others to make sure all voices are heard. Tip: Assign a remote attendee as meeting facilitator. Send a reminder email. Schedule an email to go out 10-15 minutes before the meeting. This will help as a final notice for everyone to bring their required materials and show up on time. This template is for any type of meeting and includes attendees, agenda items, notes, and organizational tools to keep your meetings streamlined. The project kickoff meeting template includes a pre-filled agenda with action items to get a new project off the ground including communication strategies to get aligned right from the start. Use the brainstorm template to get your team in the creative zone and get the juices flowing. This template includes a suggested agenda for brainstorming sessions starting out with a few minutes of meditation. The meeting minutes template will help your team quickly look at the previous meeting's agenda items and record minutes from the current meeting. The meeting notes template includes a quick agenda and plenty of space to take down decisions made, next steps planned, and stakeholders involved. Use the board meeting agenda template to record the board members in attendance and provide notes on each agenda item along with stakeholders and deliverables. This template includes an outline for your team to recap the previous action items and give current updates efficiently. This template will help focus your one on ones and discover any roadblocks your direct reports may be having. This one on one meeting template also provides space to keep up with your team's professional development goals. 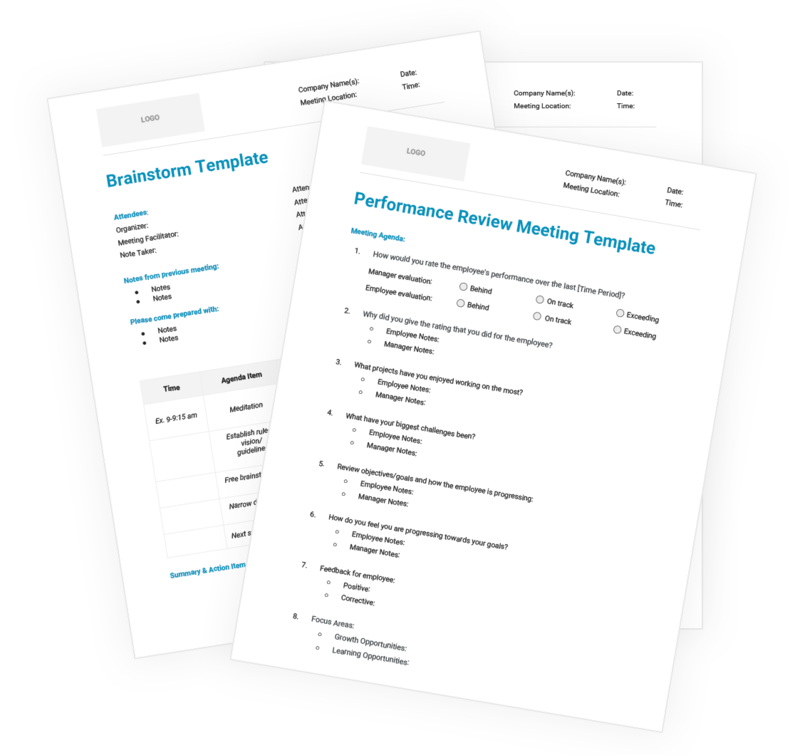 The performance review meeting template includes questions and prompts to run an effective and meaningful employee review at any level of the corporate ladder. This template includes space to add notes on previous reviews and give feedback to your team members. This template will help you to organize team meetings and provides space to check in on monthly/quarterly goals and deliverables. The scrum method includes a daily standup style meeting that asks each team member "What did you do yesterday?" "What are you working on today?" and "What are your roadblocks/obstacles?" This simple organizer will help you to keep track of your daily scrum stand-ups. This template can be used in planning meetings for product roadmaps, quarterly/yearly planning, or any meeting that requires quick decision making for a large number of items. We hope you enjoy these free meeting agenda templates and use them to make meetings more meaningful for you and your team. Using these agenda templates for many of your business meetings, try decreasing your scheduled meeting times by fifteen minutes. Less scrambling over notes, more collaborating and moving projects forward. Happy meeting!